This Elstead Sigmund 3 LED outdoor PIR wall light in graphite finish is rated IP54, ultra modern and features a swivel head so light can be directed wherever you like. Circular wall mount and side arms, with rectangular head containing three cool white 3w LED mini spotlights and adjustable PIR motion sensor mounted below. The head can be swiveled through 320° so you can direct the light up, down or outwards. PIR adjustments: range 0 – 12m, detection angle 150°, time adjustment 10 secs – 10 mins. PIR only operates during the hours of darkness and it cannot be overridden. The Sigmund range has been designed to exploit the benefits of LED lighting to their maximum. Available in 3 or 6 light fittings, with each bank of 3 LED modules that rotate by 320 degrees. 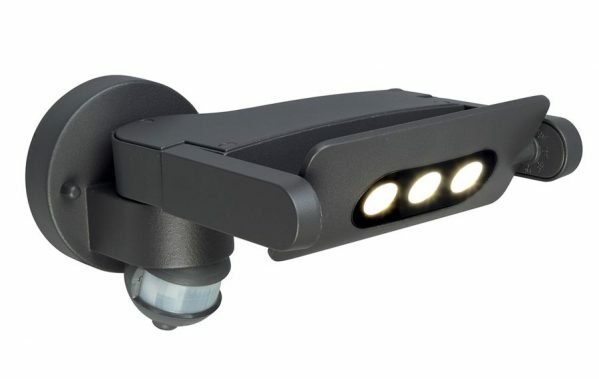 The 3 light is also available with a built in PIR sensor and they are constructed from die-cast aluminium and finished in graphite powder coating. If you are searching for contemporary outdoor lights, this PIR wall light should be considered. It looks fantastic on any outside wall to welcome visitors after dark or light a pathway in your garden. Fully weatherproof and supplied with a manufacturer’s 5 -year anti-corrosion warranty, which relates to the corrosion of finishes like this one. The 5-year anti-corrosion warranty covers the fitting itself for the specified time after delivery. The internal electronic parts, including PIR sensors, LED modules or drivers are covered against failure for a period of 2 years. After this period, the components are still replaceable, repairable or serviceable, either by Elstead Lighting or local supplier. Exterior fittings must have an IP (Ingress Protection) rating which indicates the fittings ability to prevent solids and liquids penetrating the enclosure. The higher the number, the greater the protection. The minimum rating for an outside light exposed to the weather is IP23. This outdoor motion sensor wall lantern is rated IP54. Class II double insulated and must not be earthed. There are matching fittings available in the Sigmund range that can be viewed below. This exterior light is supplied by Elstead Lighting, a British company that specialise in the manufacture and distribution of quality decorative lighting such as the Sigmund 3 LED outdoor wall light in graphite finish is rated IP54 you see here.